Attended by more than 20 international railway experts, the inaugural Singapore Rail Transport Conference (SRTC) held in November 2016 provided a platform for sharing and potential collaboration in the area of technology development and innovation among operators of some of the world’s busiest metro lines. 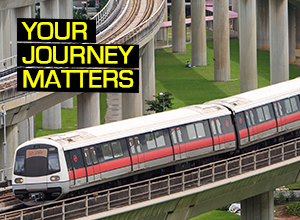 SMRT gained valuable insights as we strive to enhance rail performance and reliability. The conference also provided us with an opportunity where we could benchmark ourselves against regional transport providers like Hong Kong’s Mass Transit Railway (MTR). Here are some key learning points shared by two of our guest speakers. Professor Alfred Huan, Chairman, SMRT Technical Advisory Panel stated that SMRT has taken on “the very ambitious task and programme to upgrade its own engineering capabilities”. He added that this includes the company’s efforts to digitise data and adopt digital technology to coordinate our operations and maintenance. Professor Huan, who is also the Executive Director of the Institute of High Performance Computing at A*STAR pointed out that as SMRT continually builds up its network of expertise, “not everything needs to be in-house”. “Instead SMRT can tap on expertise within Singapore’s good eco-system of universities, A*STAR, and other research organisations”, said Huan, who was also a guest speaker at the conference. Speaking to reporters on technology advancement on the side lines of the event, Professor Lee Kang Kuen, Professor for Transportation at the Hong Kong Polytechnic University, said both Hong Kong MTR and SMRT have adopted continuous condition monitoring. This is currently seen as one of the best practices in the industry. “I can see in Singapore, SMRT is adopting the same drive as MTR in really going along with the industry best practises. With all these on-going efforts, there will be a quantum leap in reliability improvements,” he added. The HKMTR reached 520,000 mean-kilometres between failure (MKBF) in the first quarter of 2016 while SMRT aspires to achieve 400,000 MKBF by 2018. 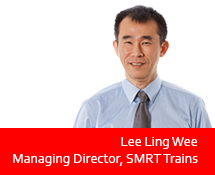 Professor Lee shared his confidence that SMRT would be able to achieve its rail reliability targets by improving from our experiences and lessons learnt in our 30 year history. “MTR started operations back in 1979, so it is actually about 10 years prior to SMRT. MTR has improved through lessons learnt over the years. For each lesson learnt we adopted improvement measures. This is how excellence can be built up. I’m sure that with the same approach being adopted by SMRT that excellence can be achieved here,” he said. When asked by a reporter what aspects of the HKMTR could be imported to Singapore, Professor Lee pointed out that each network has its own features, and it is important to share experiences and not “import”. The professor, who has over 40 years’ experience in railway Operations and Maintenance (O&M), projects and consultancy, also stressed the importance of having these sharing sessions regularly. “I am actually very delighted that this (the conference) has been done quite well where member railways get to share their experience so other members will not repeat what has gone wrong,” he said. A few days ago, a group of young engineers who were attending a one-week course as part of STEP-IN* programme came back to the main maintenance depot at Bishan to help their more senior colleagues investigate the root cause of a technical problem on the train fleet operating on the North-South and East-West Lines (NSEWL) and discuss the recovery plan. That day, we had a spate of train-related defects that caused three trains to be taken out of service, when these trains completed their regular service runs at terminal stations. This is what we call “stock change” or “planned withdrawal at terminal stations”. There is nothing unusual about a group of engineers coming back to the office to work until 3am. What is unusual is that, they came back on their own accord, without being told to so. In fact, I have given specific instructions to their bosses, not to disturb the participants of the STEP-IN programme unless it is an emergency, so that the participants can focus on the one-week course. In this case, there was no service disruption. Although there was a need to get to the bottom of the issue because it had the potential of becoming a fleet issue, we did have other engineers to deal with the immediate concern. I know exactly what these engineers, who have been with us for not more than two years, went through, as they went about their discussions and investigations that night. It is no different from what I went through as an engineer in the air force for 23 years: root cause analysis, digging out historical records to understand previous maintenance work done on the affected trains and components, etc. The thought process and mantra have been drilled into them. These young engineers demonstrated a thirsty curiosity to find out why things happened. They listed down every possibility, without jumping to conclusions. They repeatedly asked why the fault occurred (in the same way one might peel an onion), not accepting a case of “No-Fault-Found” (NFF) even if the fault “Can Not be Duplicated” (CND) after the affected trains returned to the depot. There was, in the air that night, an all-consuming desire to get to the root cause, leaving no stone unturned. For them to act together in unity, I am sure there was also esprit de corps and a sense that we are in this together. When I first joined SMRT, I set a goal of building a robust rail engineering capability within SMRT Trains. To do so, we aim to strengthen three key areas: people, process and technology. Three and a half years on, this goal is still an on-going journey. The two areas of process and technology are straightforward enough, as part of SMRT’s rail improvement efforts. To strengthen our processes, we adopt a life cycle approach to all our critical assets in trains, track, traction power, signalling and communication systems. Such an approach requires us to work closely with the Land Transport Authority (LTA) to better manage the timeliness of asset renewal for such hardware. Each renewal presents us with opportunities to improve the inherent design reliability, availability and maintainability (RAM) of the assets leveraging on the operational experience that our staff have accumulated over the past three decades. As part of process enhancement, we also decided to review our maintenance regime regularly over the asset life cycle. Instead of blindly following manufacturers’ maintenance manuals, the revised preventive maintenance tasks must take into account field experience and local operating context, such as asset age, utilisation patterns, environmental conditions and operational requirements. To enhance the use of technology, we adopt a predictive maintenance approach. This means that we collect data and information on asset conditions and use analytical tools to project how long more the assets can last before they need to be replaced, what additional maintenance efforts are needed to ensure that the assets will continue to perform reliably until they are replaced. 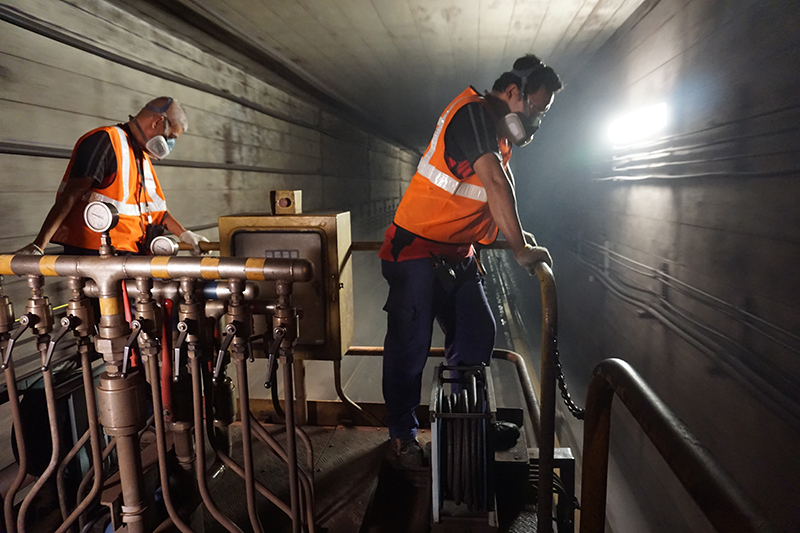 Traditional railway maintenance relies heavily on engineering hours to run specialised engineering vehicles on the rail network to collect these data and information. However, given the limited engineering window, the same track location is only surveyed once every few months. Today’s technology allows us to equip passenger trains with on-board sensors and survey the same track location at a much higher frequency. All these translate into opportunities for better maintenance performance. Hardware issues are being addressed through better work processes. At the same time, more extensive fielding of technology, such as railway condition monitoring devices, complement work processes so that maintenance and renewal efforts are done more efficiently and effectively. But no less important is our drive to strengthen our heartware – our people. Indeed, the toughest and most complex part of building a robust rail engineering capability within SMRT Trains lies in the area of people development. When we first started this journey three-and-a-half years ago, SMRT had about 180 rail engineers, and morale was low. Today, we have boosted the number to more than 400. Other than a small number of mid-careerists who have joined us, the majority of the new recruits are either fresh graduates from local universities or in their late twenties. Numbers alone are not enough. We need to organise our technical workforce into a value chain spanning from maintenance and engineering, to plans and projects. Take for example, the Rolling Stock (this means trains in railway lingo) Engineering Centre. 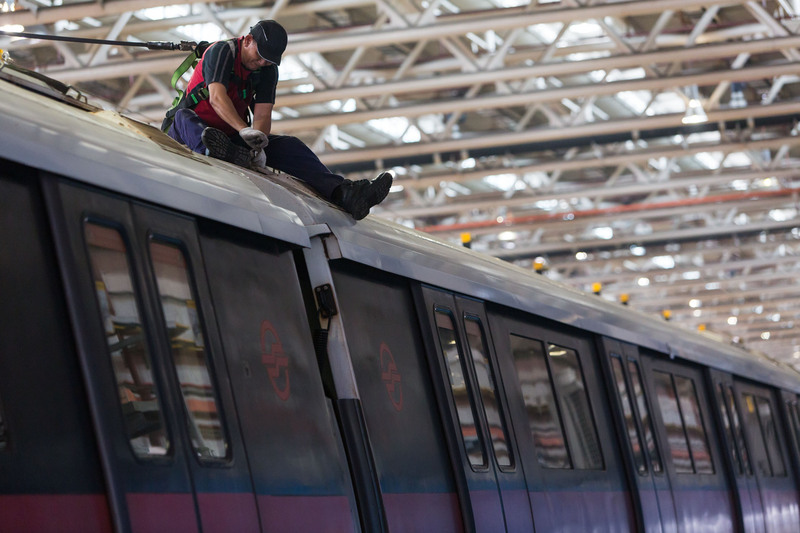 It has been organised into four departments: Rolling Stock Depot (RSD) and Rolling Stock Workshop (RSW), where staff perform maintenance and inspection tasks on trains and components respectively. With the data and information captured by RSD and RSW, Rolling Stock Engineering (RSE) staff analyse reliability trends and initiate engineering studies to review and improve reliability. Finally, Rolling Stock Project (RSP) staff follow up with the proposed reliability enhancement recommended by RSE and translate these recommendations into concrete plans by justifying for resource funding. They also follow through the plans by working closely with LTA to translate these plans into modification or renewal projects. When modified or renewed, the assets go back into the hands of RSD and RSW with a higher inherent reliability, availability and maintainability. Participation in this cycle of value chain and staff rotation throughout the various parts of this value chain will not only allow our engineers to grow their competencies, knowledge, skills and experience, it will prevent silo thinking. Rotating in and out of all four departments means that all engineers will develop an empathy for the challenges facing their colleagues in other engineering centres. This not only allows us to deepen and broaden our rail engineering capability, it fosters the development of an esprit de corps. I think this is value creation, and it is replicated in the other engineering centres in SMRT Trains: Signalling and Communication, Permanent Way, Power, Systems and Technology Integration, Integrated Facilities. We have developed roadmaps for all three areas of people, process and technology. These are not just words and paper concepts. They are actions in different phases of execution. Following these roadmaps, we may well achieve a more robust rail engineering capability in SMRT Trains within the next few years. But, will it last? The life cycles of rail assets are measured in decades, not years. For it to last, I think we need to engender the right ethos and culture among our staff. Our newly recruited engineers must be groomed into good leaders, imbued with the right values and attitude so that they can set a good example for the rest of the technical workforce as they progress in their careers. From this perspective, what happened a few days ago when the group of young engineers came back voluntarily to support a recovery effort is encouraging. I am heartened to see that these engineers have thoughts that lead them to curious and determined action to find root causes. In time to come, I hope that these actions will become habits across SMRT Trains. Working together with esprit de corps and over time, we can and will rewrite the destiny of SMRT Trains and the nation’s experience of the rail network. *SMRT Trains Engineering Professionalisation INduction or STEP-IN is an in-house five-year, on-the-job training programme in collaboration with local and overseas academic institutions. STEP-IN is conducted with short, regular doses of structured training to equip newly recruited engineers as they take their first steps into the rail industry with the necessary rail-related knowledge and experience. The programme is designed so that they can be accredited as chartered rail engineers at the end of their first 5 years with SMRT Trains. A related programme, STEP-UP, is intended for mid-career railway engineering staff to uplift their professional competencies after several years in the industry. Together, STEP-IN and STEP-UP develop railway engineering staff to their fullest potential. 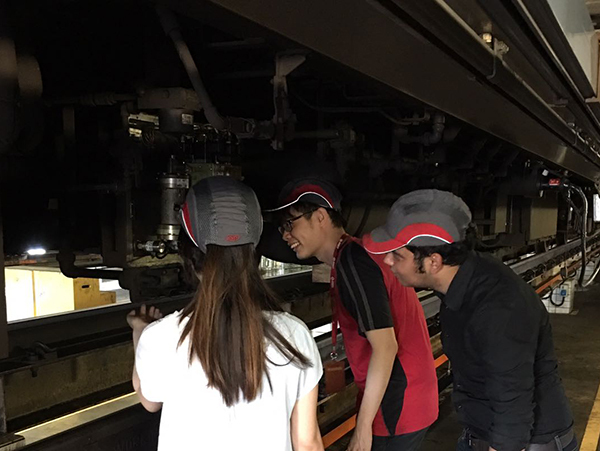 SMRT’s engineering team tracks closely the performance of all rail lines because the data collated allows the team to know which areas of the rail network need more attention. Such data is shared with the public too. SMRT has been reporting quarterly statistics on the performance of the North-South and East-West Lines (NSEWL) on SMRT’s corporate website. Doing so allows commuters to keep track of key performance indicators for our rail system, such as delays of more than five minutes, disruptions of more than 30 minutes and the train withdrawal rate. 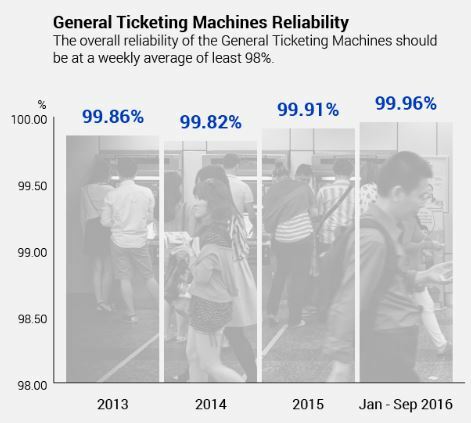 We have recently included data on the reliability of MRT station assets used by commuters, such as escalators, lifts and fare gates. We will continue to publish key service performance indicators on a regular basis so that you can follow our journey in improving reliability on our network. 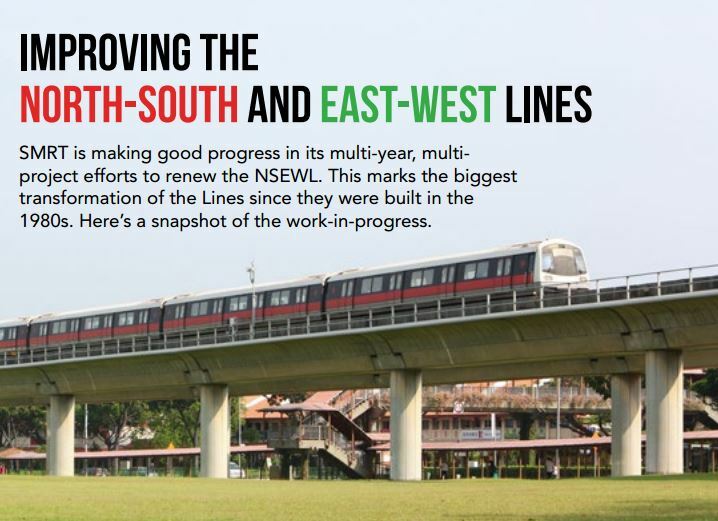 The re-sleepering, re-signalling, third-rail replacement and power network improvement project will contribute to better reliability on the NSEWL – Singapore’s longest, oldest and most heavily-used rail lines. The mean kilometre between failure (MBKF) rate will improve, thanks to stepped up our maintenance efforts. Furthermore, our multi-year, multi-project renewal efforts for the NSEWL are on track. 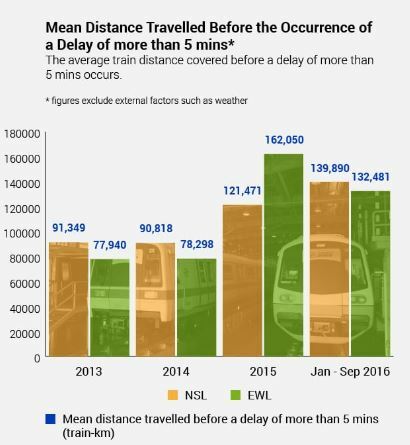 While we acknowledge that the improvement in NSEWL service reliability may not seem to be significant in the first 10 months of 2016, we are quietly confident it will demonstrate clear improvements in the coming years. The better MKBF numbers will translate to better journeys for commuters with trains that run more reliably, and shorter waiting times as more trains are deployed on the NSEWL. We have been tracking the sources of our service delays over the past three years and classifying them into categories such as third-rail, signalling, traction power and various types of train-related faults. For each category, we have a series of initiatives in place to address these faults in the immediate, medium and long term. Improvements in MKBF rate will be achieved as we complete each of these initiatives. For example, we had a number of third-rail-related incidents in the first 10 months of the year that resulted in planned service delays. These are delays of not more than 10 minutes caused by engineering work that the engineers needed to carry out during traffic hours whenever sensors installed on selected passengers trains pick up defects that have the potential of causing more than 30 minutes delays. As part of our short term improvement initiatives, the use of these sensors allow us to identify an emerging issue and nip it in the bud before it caused a longer delay and inconvenienced commuters even more. With the completion of third-rail replacement by March 2017, as part of our long term improvement initiatives, we expect that such incidents will be significantly reduced. As of November 2016, 33% of delays lasting more than five minutes were signal-related. We expect these to reduce significantly after we successfully migrate our ageing signalling system to the new Communication-Based Train Control (CBTC) system. The CBTC system has a higher level of redundancies. The new signalling system will be activated on the NSL in 2017 and we are working hard to complete the EWL by end-2018. We have intensified our efforts to renew the equipment that provides traction power to the network. There are also similar fleet-wide renewal of components to address propulsion, door and brake systems that constitute 90% of train-related delays. These efforts take several years to complete because of the length of the NSEWL, and the size of the fleet. As we serve commuters nearly 20 hours a day, and 365 days a year, we have limited time to carry out renewal and maintenance works. For example, there are 188,000 30-year-old timber sleepers on NSEWL to be replaced. 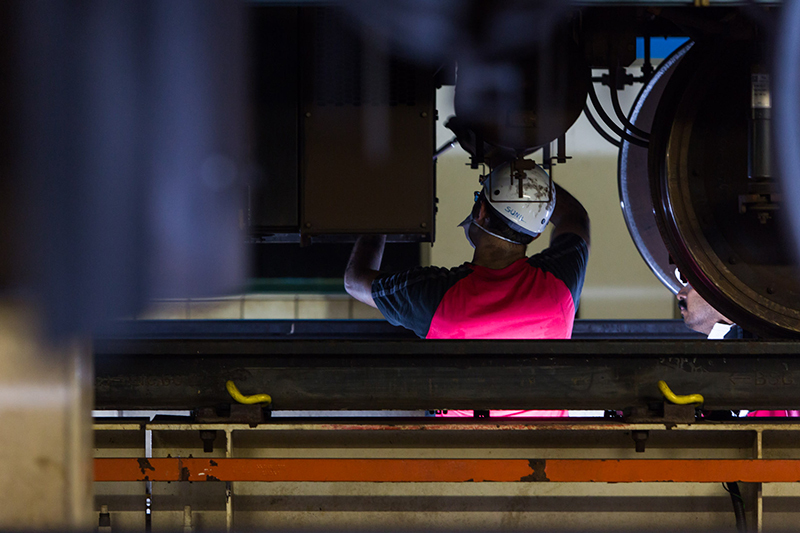 With 141 six-car trains and 24 doors on each train, there are 3,384 train doors for us to work on. Nonetheless, with a laser-sharp focus and a never-give-up determination to catch up with our counterparts in Hong Kong and Taipei, we believe that there is only one direction for NSEWL rail service reliability to go in the coming years: Up. Commuters may wish to refer to Your Journey Matters – most recently updated in August 2016 and also available on our website– for a comprehensive primer on SMRT’s efforts to renew and improve the NSEWL.